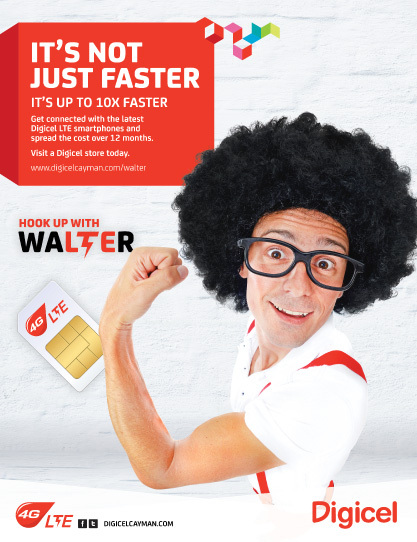 Creating a full 360 campaign for the relaunch of 4G LTE by Digicel in the Cayman market. 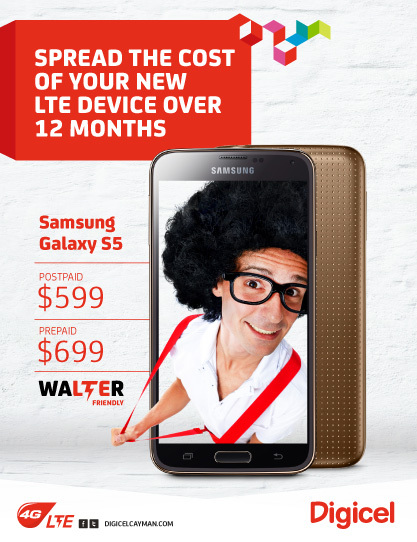 4G LTE is a new high-speed mobile network specifically designed to carry data. It was introduced to the Cayman market is November 2013 and two separate campaigns had been launched previously but these had not driven demand for 4G LTE and the market as a whole was unaware of and apathetic to the new technology. 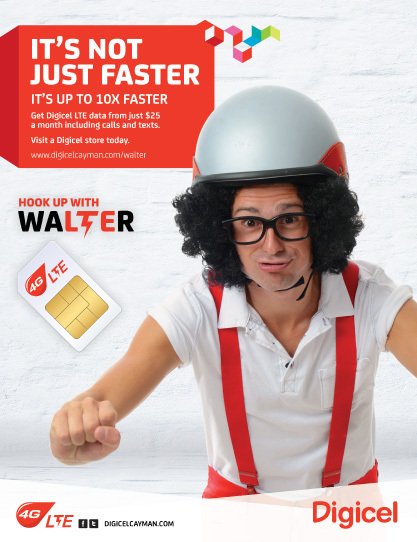 A further challenge was that telecommunications companies in Cayman had marketed the older ‘3G’ as ‘4G’, greatly reducing the impact of the 4G LTE message. We were engaged to create a new campaign to both educate the market about the arrival and benefits of 4G LTE, and to drive sales of plans. 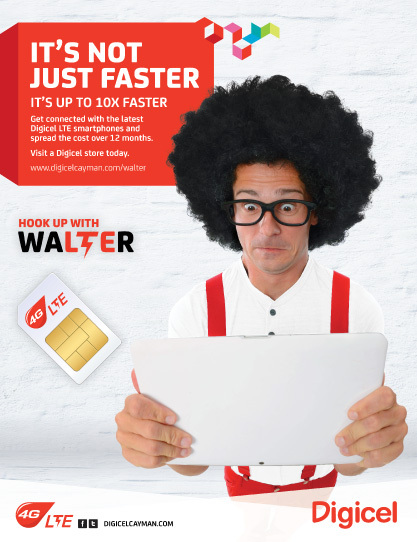 We developed a campaign around a new Digicel brand ambassador for 4G LTE – Walter – a fresh, fun, friendly and engaging ambassador with an unusual appearance designed to grab people’s attention. In order to get the perfect look for the character we worked through test shots with the client and then conducted a photo-shoot with the selected model. The use of an ambassador provided a key element that was extended through every campaign channel and allowed the campaign to come alive with the character being a physical presence in stores, at events and on the street. 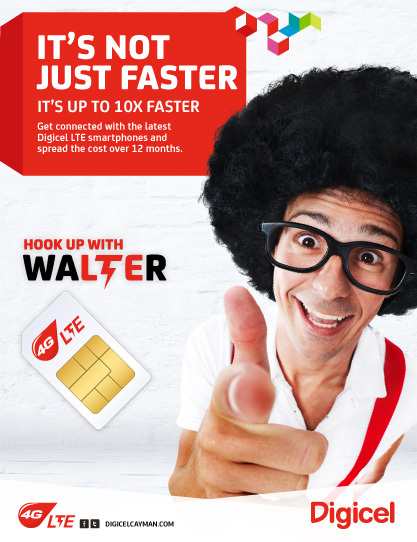 The branding of ‘Hook up with Walter’ was used as a logo for the campaign with the letters LTE highlighted in Walter’s name. 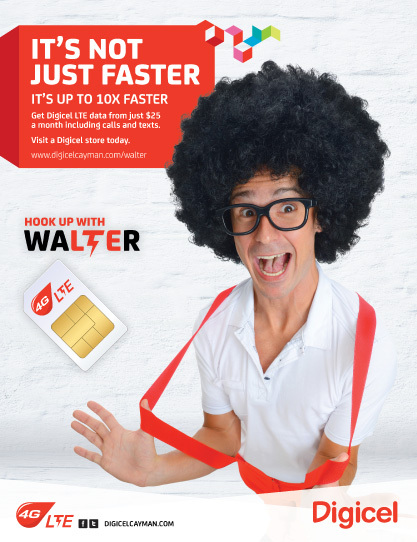 ‘4G’ was largely dropped from all communication with the phrase LTE continuously emphasised to provide a clearer break from the 3G/4G confusion in the Cayman market. Campaign deliverables included a new responsive website, full creative suite, t-shirt design, store thematics, social media campaign recommendations and meme development, street activities recommendations, radio scripting and online behavioural advertising. In addition we provided operational advice regarding financial incentives and customer processing.